The gallery is pleased to present its fourth exhibition of egg tempera paintings and works on paper by Sarah McEneaney. The exhibition will comprise works completed over the last two years. In keeping with her work produced during the last decade, the artist’s subject matter is drawn from her everyday life in Philadelphia and her extensive travels. 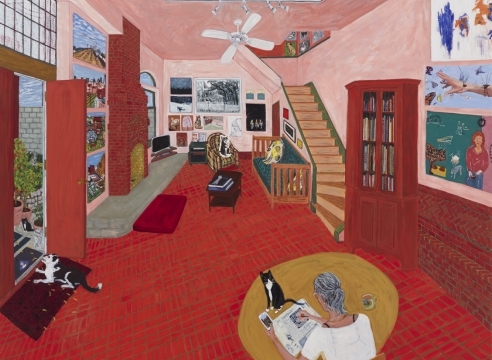 McEneaney allows the viewer into her world, which is meticulously and keenly observed. Many of the works in this show were painted from locales as diverse and far flung as New Mexico, Jordan, France, Germany, and the United Arab Emirates. Her work has been in many museum exhibitions throughout the United States and in Europe including over the last two years at the Delaware Art Museum, the Philadelphia Museum of Art, the Walton Arts Center, Art Museum, Rhode Island School of Design, and Kunstmuseum, Ahlen, Germany. McEneaney received a certificate from the Pennsylvania Academy of the Fine Arts and studied at Philadelphia College of the Arts. McEneaney has had numerous solo gallery exhibitions both in New York and Philadelphia, where she has lived and worked for many years. Her work was the subject of a major retrospective at the Institute of Contemporary Art ICA at University of Pennsylvania in 2004. In 2012 the City of Philadelphia will unveil a commission by the artist, a composite landscape of Philadelphia’s parks, which will be installed in its new Youth Study Center.